Renowned as the worldwide industry standard, more Styro•formers are in use than all other shielding block mold cutters combined. Styro•former® offers accurate, easy and fast cutting with minimal training. A hand-held tracing stylus allows quick radiograph outlining to provide a smooth and efficient block cutting procedure. Our Styro•former® Power Lift LT features panel mounted drive controls for both source and block arm distances. A quick change wire system uses unique thumb screws and a table mounted measuring template for quick, easy wire changes. Radiotherapy teams worldwide have come to depend on Huestis Medical for quality and cost effective radiotherapy products. The Styro•former®is FDA registered and CE certified. Manual tracing produces smooth, accurate cuts with minimal training. Accurate cuts save time and material. Short, cutting wire is kept tight in a rigid box frame to eliminate bowing. Never necessary to apply downward pressure to keep the wire tight. Rigid box frame ensures that cutting wire is precisely aligned between the source point and block tray. Nichrome cutting wire fits into frame’s unique electro-mechanical bushings. Bushings hold wire with a flat grip, for long wire life and easy wire changes. FREE cutting wire for life of machine. Spring-loaded, Teflon tracing stylus moves freely in every direction. Unhampered by limitations of an X or Y axis for complete maneuverability. Can be adjusted to any treatment machine for universal application. Work area remains stationary at a comfortable desktop working height. Freestanding table, and calibrated column can be placed in almost any small area without wall attachment. Drive controls are panel mounted for quick, push button height adjustments. Position measurements are easily read directly from the vertical column. Easily adjustable thumb screws allow quick cutting wire changes. Convenient storage bin holds up to three tracing tips. Automatically boosts wire temperature to adjust for wire deflection. Simple switching system reroutes the current through another circuit with its own potentiometer. Can be pre-set to minimize distortion and maximize productivity. Inexperienced operators can have limits set by a supervisor. Audio/visual alarm warns when too much pressure is applied by operator. Model SF 319-4 includes both Power Lift and Auto Boost options. Low-melt alloy #158 or cadmium-free, medium-melt alloy #203. Convenient Mold Room Kits and other radiotherapy accessories available. Radiotherapy departments can now take advantage of the cost savings and versatility of a compact tabletop Compu•cutter® system. The Compu•cutter® III is less than half the size of its predecessor without sacrificing quality and accuracy. It is available as a complete package or as a single unit which can plug and play with your existing configuration. Huestis software is compatible with any Windows® based Op System, allowing for easy image manipulation, correction and cutting. Compu•cutter® III is the next generation in the Huestis Medical block cutting system. Radiotherapy teams worldwide have come to depend on Huestis Medical for quality and cost effective radiotherapy products. 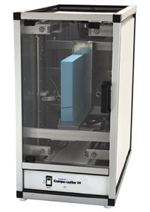 The Compu•cutter® III is a CE certified radiotherapy shielding block cutter. Computerized, four-axis cutter ensures accuracy of ± 1 mm. Built-in checks minimize operator error and time consuming re-cuts. Allows review of outline on monitor. Drawing package feature allows for easy image manipulation and correction. Cut path simulation prior to actual block cut. All functions and set-ups are completely computer controlled. Template printout facilitates mounting shielding block on tray. Digitized block outlines can be easily transferred from treatment planning. Eliminates redundant input of block outlines from radiographs. Imported outlines may be cut immediately or stored for later use. Radiograph is aligned on crosshairs and traced with a digitized mouse. Windows® based program digitizes and stores data and patient files for easy reference or modifications. Easy input of patient/block information. User may select any cut path to connect multiple block outlines. Ability to “flip” image for fast AP/PA or L/R lateral blocks, or change any parameter without re-digitizing. Image can be moved to any position on the block to allow for the conservation of styrofoam use. Fast .45”/sec. (1 cm/sec.) cut speed. Cutter is safely enclosed in cutting bay. Adjustable temperature for variations in foam densities. Safety interlock for open door position. Custom defaults: S.F.D., S.A.D., S.T.D. Distance changes can be factored in after digitizing or TPS import. Determines smallest block required for shape or combination of shapes. Our full system for the Compu•cutter® III includes the cutter, computer, custom software, printer, digitizer and an optional label printer. Our system can be purchased as a cutter and software package only, to be used with existing peripherals in any radiotherapy department to reduce expenses. Footprint is smaller than our Styro•former®. Measures 30" (76.2 cm) tall x 15.75" (40 cm) wide x 30" (76.2 cm) deep. weighs approximately 60 lbs. (27.27 kgs).